Amadeus is a 1984 American period drama film directed by Miloš Forman, adapted by Peter Shaffer from his stage play of the same name. The story, set in Vienna, Austria, during the latter half of the 18th century, is a fictionalized biography of Wolfgang Amadeus Mozart. 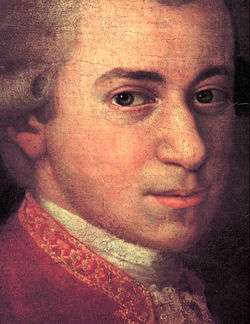 Mozart's music is heard extensively in the soundtrack of the movie. Its central thesis is that Antonio Salieri, an Italian contemporary of Mozart is so driven by jealousy of the latter and his success as a composer that he plans to kill him and to pass off a Requiem, which he secretly commissioned from Mozart as his own, to be premiered at Mozart's funeral. Historically, the Requiem, which was never finished, was commissioned by Count von Walsegg, and Salieri, far from being jealous of Mozart, was on good terms with him and even tutored his son after Mozart's death. The film was nominated for 53 awards and received 40, which included eight Academy Awards (including Best Picture), four BAFTA Awards, four Golden Globes, and a Directors Guild of America (DGA) award. As of 2016, it is the most recent film to have more than one nomination in the Academy Award for Best Actor category. 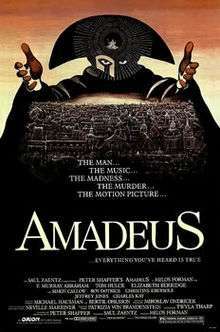 In 1998, the American Film Institute ranked Amadeus 53rd on its 100 Years... 100 Movies list. The story begins in 1823 as the elderly Antonio Salieri (F. Murray Abraham) attempts suicide by slitting his throat while loudly begging forgiveness for having killed Wolfgang Amadeus Mozart (Tom Hulce) in 1791. Placed in a lunatic asylum for the act, Salieri is visited by Father Vogler (Richard Frank), a young priest who seeks to hear his confession. Salieri is initially sullen and uninterested, but eventually warms to the priest and launches into a long "confession" about his relationship with Mozart. Salieri goes on telling his tale through the night, and into the next day. He reminisces about his youth, particularly about his devotion to God, and his love for music, despite his father's plans for him to go into commerce. He pledged to God to remain celibate as a sacrifice if he could somehow devote his life to music, and perceived his father's subsequent death as divine intervention to make this possible. Years later, Salieri is part of the 18th-century cultural elite in Vienna, the "city of musicians". He is respected, financially well-off, and has been appointed court composer for Holy Roman Emperor Joseph II (Jeffrey Jones). He is content, and believes his successes are God’s rewards for his piety. The famous child prodigy Mozart arrives in Vienna, and Salieri goes to a performance hoping to meet him, convinced that Mozart's genius must be a gift from God. Salieri secretly observes Mozart, and is shocked to discover that rather than the paragon of virtue that he has imagined, Mozart is in fact boorish, irreverent, and lewd. Later, when Mozart meets the Emperor, Salieri presents Mozart with a "March of Welcome," which he had toiled to create. After hearing the march only once, Mozart plays it from memory, tactlessly critiques it, and effortlessly improvises a variation, transforming Salieri's "trifle" into what later would become the Non più andrai march from his opera The Marriage of Figaro. Salieri reels at the notion of God speaking through the childish, petulant Mozart: nevertheless, he regards his music as miraculous. Gradually, Salieri’s faith is shaken. He believes that God, through Mozart's genius, is cruelly laughing at Salieri's own musical mediocrity. Salieri's struggles with God are intercut with scenes showing Mozart's own trials and tribulations with life in Vienna: pride at the initial reception of his music, anger and disbelief over his subsequent snubbing by the Italians of the Emperor's court, happiness with his wife Constanze (Elizabeth Berridge) and his son Karl, and grief at the death of his father Leopold (Roy Dotrice). Mozart becomes more desperate as the family's expenses increase and his commissions decrease. When Salieri learns of Mozart's financial straits, he sees his chance to avenge himself, using "God's Beloved" (the literal meaning of "Amadeus") as the instrument. Salieri hatches a complex plot to gain ultimate victory over Mozart and God. He disguises himself in a mask and costume similar to one he saw Leopold wear at a party, and commissions Mozart to write a requiem mass, giving him a down payment and the promise of an enormous sum upon completion. Mozart begins to write the piece, the Requiem in D minor, unaware of the true identity of his mysterious patron and oblivious of his murderous intentions. Glossing over any details of how he might commit the murder, Salieri dwells on the anticipation of the admiration of his peers and the court, when they applaud the magnificent Requiem, and he claims to be the music's composer. Only Salieri and God would know the truth—that Mozart wrote his own requiem mass, and that God could only watch while Salieri finally receives the fame and renown that he deserves. Mozart's financial situation worsens due to his spendthrift lifestyle. This, combined with his heavy drinking, continued grief over the death of his father, and the composing demands of the Requiem and The Magic Flute drive him to the point of exhaustion as he alternates work between the two pieces. After a violent argument, Constanze leaves him and takes their son with her. His health worsens, and he collapses during a performance of The Magic Flute. Salieri takes the stricken Mozart home and convinces him to work on the Requiem. Mozart dictates while Salieri transcribes throughout the night. When Constanze returns in the morning, she tells Salieri to leave. Constanze locks the manuscript away despite Salieri's objections, but as she goes to wake her husband, she finds that Mozart is dead. The Requiem is left unfinished, and Salieri is left powerless as Mozart's body is hauled out of Vienna for burial in a pauper's mass grave. The film ends as Salieri finishes recounting his story to the visibly shaken young priest. Salieri concludes that God killed Mozart rather than allow Salieri to share in even an ounce of his glory, and that he is consigned to be the "patron saint of mediocrity". Salieri absolves the priest of his own mediocrity and blesses his fellow patients as he is taken away in his wheelchair. The last sound heard before the credits roll is Mozart's high-pitched laughter. In his autobiography Beginning, Kenneth Branagh says that he was one of the finalists for the role of Mozart, but was dropped from consideration when Forman decided to make the film with an American cast. Hulce reportedly used John McEnroe's mood swings as a source of inspiration for his portrayal of Mozart's unpredictable genius. The film was shot on location in Prague, Kroměříž, and Vienna. Notably, Forman was able to shoot scenes in the Count Nostitz Theatre in Prague, where Don Giovanni and La clemenza di Tito debuted two centuries before. Several other scenes were shot at the Barrandov Studios. In 1985, the film was nominated for eleven Academy Awards, including the double nomination for Best Actor with Hulce and Abraham each being nominated for their portrayals of Mozart and Salieri, respectively. The film won eight Oscars, including Best Picture, Best Actor (Abraham), Best Director (Forman), Costume Design (Theodor Pištěk), Adapted Screenplay (Shaffer), Art Direction (Karel Černý, Patrizia von Brandenstein), Best Makeup, and Best Sound. The film was nominated for but did not win Oscars for Best Cinematography and Best Editing. Amadeus, The English Patient, The Hurt Locker, The Artist, and Birdman are the only Best Picture winners to never enter the weekend box office top 5 after rankings began being recorded in 1982. Amadeus peaked at #6 during its 8th weekend in theaters. Saul Zaentz produced both Amadeus and The English Patient. The film was nominated for six Golden Globes (Hulce and Abraham were nominated together) and won four, including awards to Forman, Abraham, Shaffer, and Golden Globe Award for Best Picture – Drama. Jeffrey Jones was nominated for Golden Globe for Best Supporting Actor – Motion Picture Drama. Forman also received the Directors Guild of America Award for his work. At the end of the Oscar ceremony, Laurence Olivier came on stage to present the Oscar for Best Picture. As Olivier thanked the Academy for inviting him, he was already opening the envelope. Instead of announcing the nominees, he simply read, "The winner for this is ‘Amadeus’." An AMPAS official quickly went onstage to confirm the winner and signaled that all was well, before Olivier then presented the award to producer Saul Zaentz. Olivier (in his 78th year) had been ill for many years, and it was because of mild dementia that he forgot to read the nominees. Zaentz then thanked Olivier, saying it was an honour to receive the award from him, before mentioning the other nominees in his acceptance speech: The Killing Fields, A Passage to India, Places in the Heart and A Soldier's Story. Maurice Jarre won the Oscar for Best Original Music Score for his scoring of A Passage to India. In his acceptance speech for the award, Jarre remarked "I was lucky Mozart was not eligible this year". The aria Ruhe sanft from the opera Zaide does not appear in the film. In 2002, to coincide with the release of the Director's Cut of the film, the soundtrack was remastered with 24-bit encoding and reissued with the title Special Edition: The Director's Cut - Newly Remastered Original Soundtrack Recording on two 24-karat gold CDs. It contains most of the music from the previous two releases, but with the following differences. 1 2 "Amadeus (1984) - Financial Information". The Numbers. Retrieved December 22, 2014. ↑ Branagh, Kenneth (1990). Beginning. New York: Norton. pp. 105–109. ISBN 978-0-393-02862-1. OCLC 20669813. 1 2 The Making of Amadeus. DVD. Warner Bros Pictures, 2001. 20 min. ↑ "Academy Awards Acceptance Speeches". Academy of Motion Picture Arts & Sciences. 1985-03-25. Retrieved 2011-02-24. ↑ Sharon Waxman (March 21, 1999). "The Oscar Acceptance Speech: By and Large, It's a Lost Art". The Washington Post. ↑ "Wolfgang Amadeus Mozart - Neville Marriner*, Academy Of St. Martin-In-the-Fields - Amadeus (Original Soundtrack Recording)". Discogs. Retrieved 29 September 2016. ↑ "Amadeus Soundtrack". Academy of St Martin in the Fields. Retrieved 30 September 2016. ↑ "Past Winners: 1984 - 27th Annual GRAMMY Awards". GRAMMY.org. The Recording Academy. Retrieved 29 September 2016. ↑ "Sir Neville Marriner, Academy Of St. Martin-In-The-Fields – Amadeus (More Music From The Original Soundtrack Of The Film)". Discogs. Retrieved 29 September 2016. ↑ "Sir Neville Marriner, Academy Of St. Martin-in-the-Fields – Amadeus (Original Soundtrack Recording - Special Edition: The Director's Cut)". Discogs. Retrieved 29 September 2016. ↑ "Amadeus". The New York Times. Retrieved 2009-01-01.